You’re at the trailhead, your alarm goes off at 4 am, and you begin your hike zombie style because you slept terribly in the back of your car last night – you’ve been there. You toss and turn endlessly in your tent at the campsite that you reluctantly spent $22 on for the night – you’ve done that. Your adventures leave you exhausted, sleep deprived, and longing to slip into your comfy bed at home after every outing. Well, now you don’t have to. 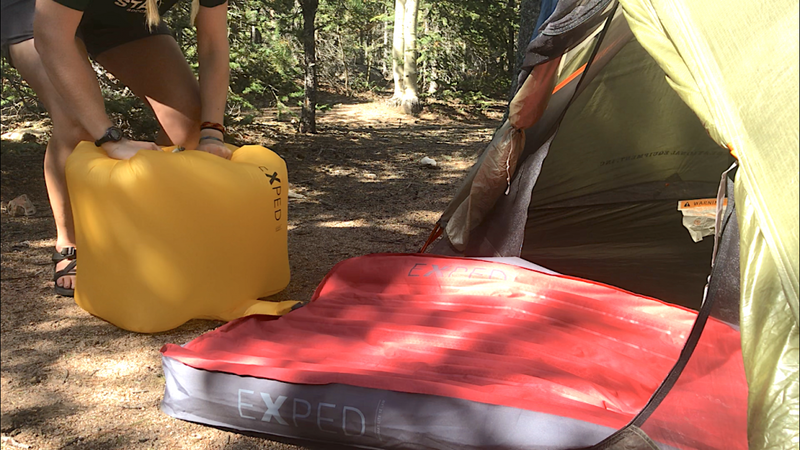 After putting Exped’s Megamat Lite 12 LXW and Mega Pillow to the test, I’m telling you that this sleep system will leave you with excuses to use it whenever possible. Sometimes I even opt to sleep on the ground using my Megamat Lite 12 LXW right next to my queen-sized bed at home. Don’t call me crazy until you’ve given this cloud of a sleeping pad a try. 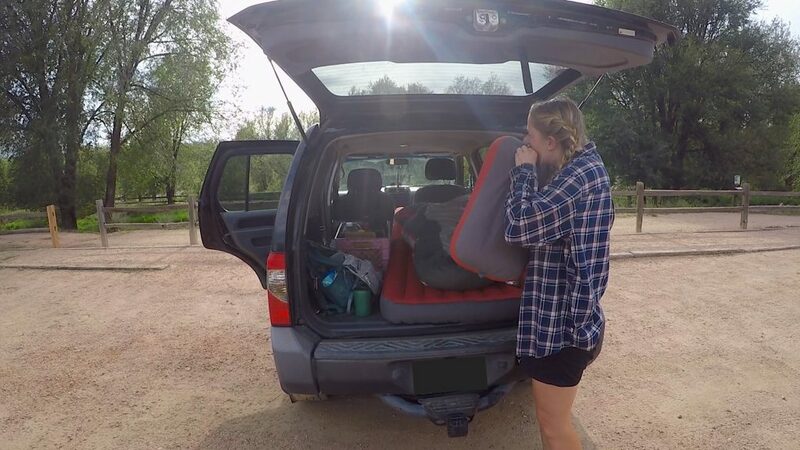 From sleepovers at friends’ houses to sleeping in the back of my car, to car camping, to overnight backpacking, this sleeping pad does it all without falling short in comfort, style, function, performance, and durability. A quick word to the minimalist-minded outdoor adventurers out there: don’t turn your nose up quite yet. 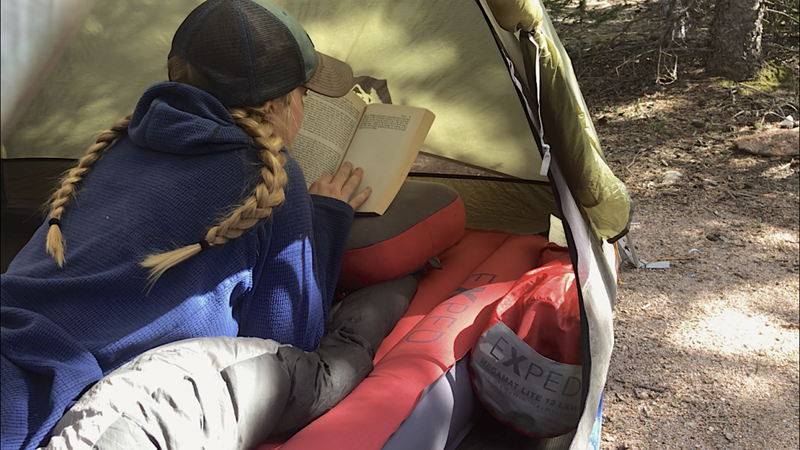 Give the Exped Megamat Lite 12 LXW and Megamat Pillow a chance – just like I did. As a professional in the outdoors, while I’m working (and playing), I spend a majority of my time sleeping on the ground (or not so comfy surfaces). Whether it’s dirtbagging it at the trailhead in the back of my car to catch that alpine start, or front country camping with students, teaching them bear safety and how to set up a tent, or ditching society for a couple days to walk into the wilderness with a heavy pack – I live and breathe camping. I wouldn’t have it any other way. I chose this life. I love this life. Those of you involved in the outdoor world would probably agree that there’s nothing better than a good night’s sleep in the wilderness—curled up tight in your warm sleeping bag with the crickets chirping a melodious lullaby. And quite frankly, the latter is also true; there’s nothing worse than a bad night’s sleep in the wilderness—you’re cold, you’re tossing and turning all night because you can’t get comfortable. I’ve had my fair share of both considering I’ve spent more than 300 days camping and backpacking over the years with students and on personal trips. 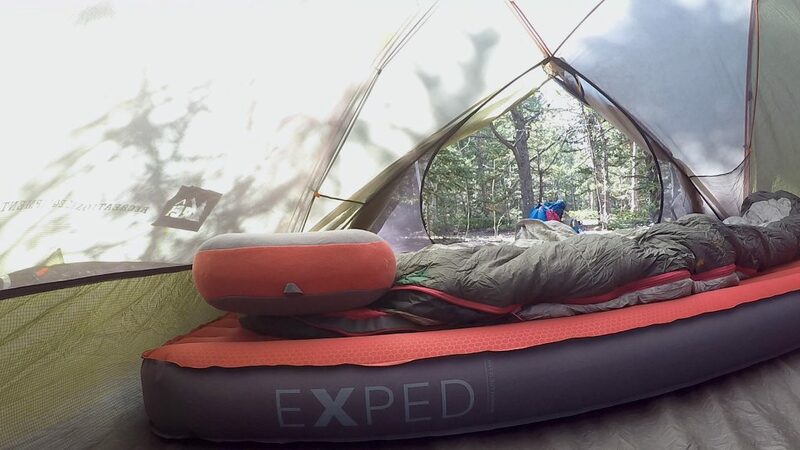 Recently, the best nights of sleep I’ve gotten while camping are tied to Exped’s Megamat Lite 12 LXW and Mega Pillow. This motherload of a sleeping pad and pillow are the definition of an ultimate luxury sleep system, one of the best you’ll find on the market in regards to comfort and compact ability. Though I was skeptical at first due to the size and bulkiness compared to other sleeping pads I’ve used, the Megamat Lite 12 LXW meets many of the high standards I have for sleep systems. 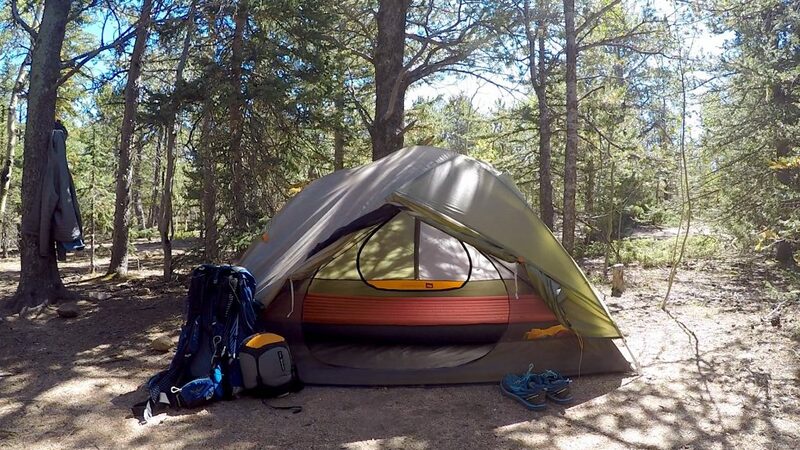 After several overnight backpacking trips in the Colorado Mountains, car camping at multiple trailheads, and front country camping in Grand Teton National Park this summer, I have truly put the Megamat Lite 12 LXW and Mega Pillow to the test. Exped isn’t kidding when they describe the Megamat Lite 12 LXW as a cloud. There wasn’t a single night that I didn’t get a good night’s sleep when using the Megamat Lite 12 LXW sleeping pad. I love that it’s big enough to allow me to sleep on it without rolling off. The Mega Pillow also has attachments to the sleeping pad so you don’t have to worry about searching in the dark for your slippery pillow. This is a big deal for me because I shift a lot in my sleep. It is also a whole 4.7 inches thick, which allows a tummy/side sleeper like myself to lie comfortably without any body parts jamming into the ground during the night. With other sleeping pads I’ve used in the past, I would frequently wake up in middle of the night to discover my hip half asleep and touching the ground. A comfortable night’s sleep is nice on personal trips, but when working with students, it’s critical to my job performance. 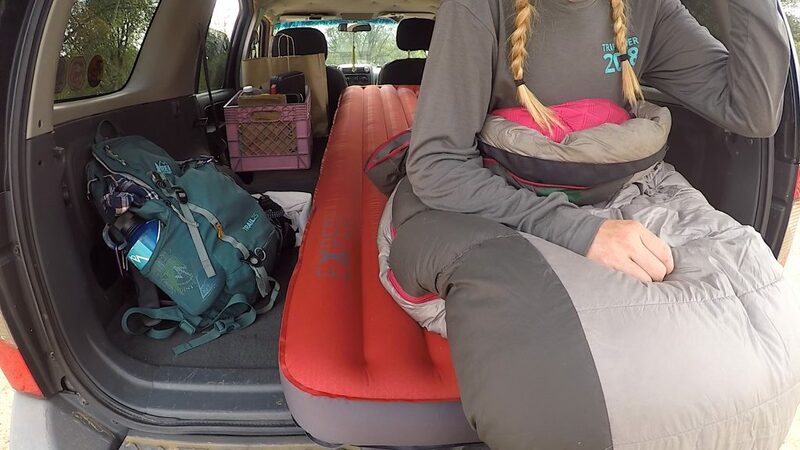 When fully inflated the Megamat Lite 12 LXW looks like a small air mattress, which it essentially is, but it still compresses down to half the size of a rolled sleeping bag. Amazing! The Mega pillow is just shy of the size of a normal pillow and matches the Megamat’s comfortable fabric exterior even more so. The Megamat Lite 12 LXW is easy to inflate and deflate due to the two-valve system it contains. The one-way inflation valve pairs perfectly with the 85L stuff sack (AKA Schnozzel pumpbag) that it comes with and allows you to add or release minimal amounts of air without all the air coming out at once after inflated with the stuff sack. This allows you to get a precise, perfect fill for your comfort style and the Schnozzel pumpbag saves you 30 precious breaths and almost passing out which is always a plus. The Mega Pillow also has the same one-way valve inflation feature, so I can lie on the pillow and slowly let the air out until it’s at the right fill. The Megamat’s stuff sack inflates by waving it around like a bug net, then rolling the top shut as many times as it allows you to. This makes the Schnozzel pumpbag tight and easy to pump. On average I can fill the whole pad with 2-3 inflations of the Schnozzel pumpbag. In case of puncture or damage to the sleeping pad, the Megamat Lite 12 LXW comes fully equipped with a repair kit- one which thankfully remains unused. What’s also wonderful about the Megamat Lite 12 LXW is that the Schnozzel pumpbag is waterproof and doubles as a dry bag stuff sack for food and clothes. Genius! Though larger and bulkier than sleeping pads I have used in the past, the Megamat doesn’t sacrifice comfort, which I am a huge fan of. I have done multiple two-day, one-night backpacking trips, and everything I needed fit in my 48L pack- Exped Megamat Lite 12 LXW and Mega Pillow included. Not once did I wish I had left my Exped sleep system at home and opted for my more minimalist sleeping pad and pillow. A perfect night’s sleep in the backcountry will leave you with no regrets. I would not sacrifice the bulk and weight for longer, multiple day backpacking expeditions. I did, however, embark on an 8 day thru-hike of the Teton Crest Trail, and while I left the Megamat Lite 12 LXW behind, I still brought the Mega Pillow along for extra comfort. Some people just settle for a stuff sack filled with clothes, but the Mega Pillow isn’t a weight/bulk sacrifice considering it packs down smaller than a soda can and weighs only 6.5oz. 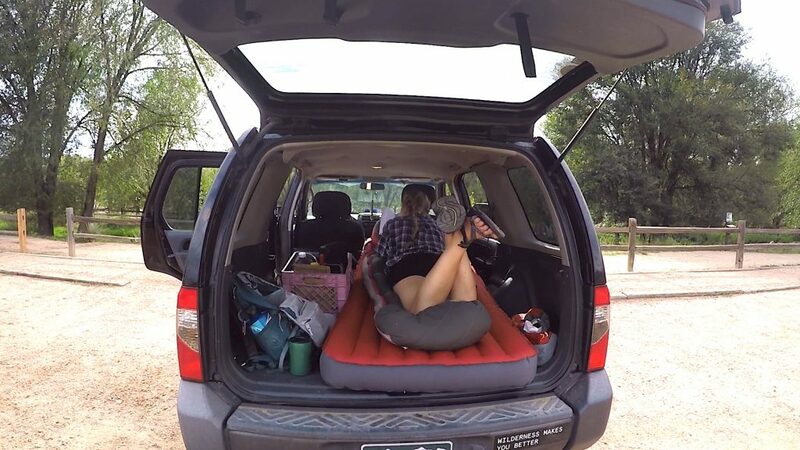 I have found that this sleeping pad is best for car camping, sleeping in the back of your car, and for short overnight backpacking trips. I would not sacrifice the bulk and weight for longer, multiple day backpacking expeditions. It’s a little bulky and barely fit in the back of my Xterra, but I was able to make it work by putting both the seats down and pushing the passenger’s seat forward. 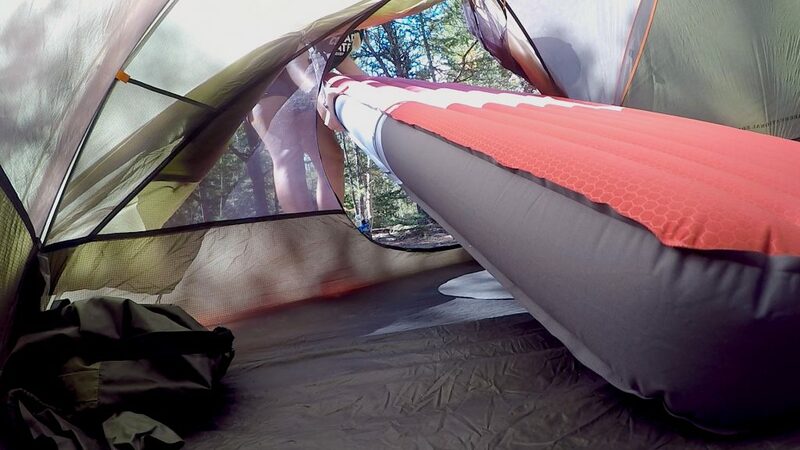 The Megamat Lite 12 LXW fits perfectly in my 3-person tent. Though because of its large width, it turned my 3-person tent into a 2-person tent. This was still acceptable for me because most of my overnight backpacking trips were solo or with just one other person. The Mega Pillow is even more versatile than the Megamat itself. Pair it with the Megamat Lite 12 LXW for the ultimate luxury sleep system, or take the Mega Pillow itself on the go as a more bulk/weight affordable luxury. I have used the Mega Pillow anywhere from a 6-day hiking expedition up Mount Kilimanjaro, to 18-hour airplane rides, to an 8-day thru-hike on the Teton Crest Trail. If anything, the Mega Pillow alone is just an extra step of luxury you didn’t have before if you opt to bring it on your adventures. The material of the Megamat Lite 12 LXW is durable and it is finished with a soft, luxurious fabric, which allows you to sleep directly on it with a blanket or open sleeping bag on top of you if you choose. Every other sleeping pad I’ve used is made of a plastic material that isn’t the most comfortable when sleeping directly on it. The Mega Pillow is made of perhaps even softer fabric, which makes me even more excited to jump into my sleeping bag at night and hit the hay. The Megamat Lite 12 LXW even has an R-value of 5.3, which means your days of falling asleep shivering are long gone. Though I have yet to test it in the snow, I would trust that R-value to keep me warm in the coldest conditions. The Megamat Lite 12 LXW also works well in even the bumpiest terrain. You can only pitch your tent in the lumpy grass or rocky gravel? No problem. The Megamat Lite 12 LXW makes everything underneath your tent or tarp vanish while you sleep soundly. When I went on an overnight trip in the Lost Creek Wilderness with my parents we had no choice but to pitch our tent in an area that was already established. This spot, however, had small mounds of dirt in patches and holes in other parts. My initial upset faded after I set up the Megamat Lite 12 LXW and laid on it because the features beneath my tent were indistinguishable. The Megamat Lite 12 LWX grew on me as I put it to the test and it fully met my expectations. I was undoubtedly skeptical at first due to the size and was even taken aback by it a little. I have become accustomed to minimalist minded thinking as I have spent the past year preparing for a thru-hike of the Colorado Trail. By no means is this sleeping pad fit for a lengthy thru-hike, but it did shatter my perception that you have to sacrifice comfort to go camping and on overnight trips. When I read the Megamat Lite 12 LXW’s product description on the website, they made it clear that this sleeping pad was going to be big. They also fully described all the functions, features, materials it was made out of, dimensions, and weight. I was prepared for a large sleeping pad, but when I pulled it out of the box my initial reaction was still surprising. I had never seen a sleeping pad so big rolled up, and I was immediately comparing it to the sleeping pad I previously used, which packs to a soda can size. When I inflated it for the first time, I had no problems because the descriptions and videos on the website fully prepared me. Exped’s website described the material of the Megamat as “laminated polyester surface fabric”, which didn’t give me an idea about how soft it was going to feel. That was a very pleasant surprise when I laid on it for the first time and realized how luxurious the fabric finish was to the touch. Before buying this product you need to be prepared for the fact that this is very functional and comfortable for what it is. This isn’t a minimalist, backpacking expedition piece of gear. The Megamat Lite 12 LXW is big! 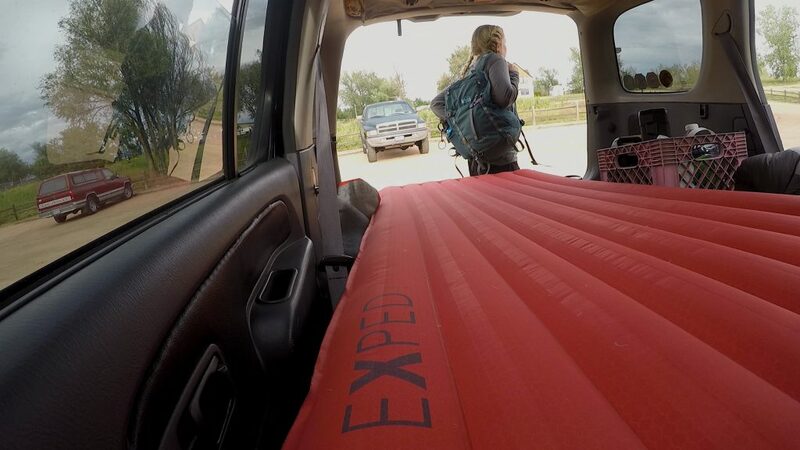 If you have a tiny tent and a tiny car, you will probably struggle to fit this sleeping pad into your life. The Mega Pillow, on the other hand, is quite easy to bring along for any adventure so don’t hesitate there if you’re looking for added comfort. 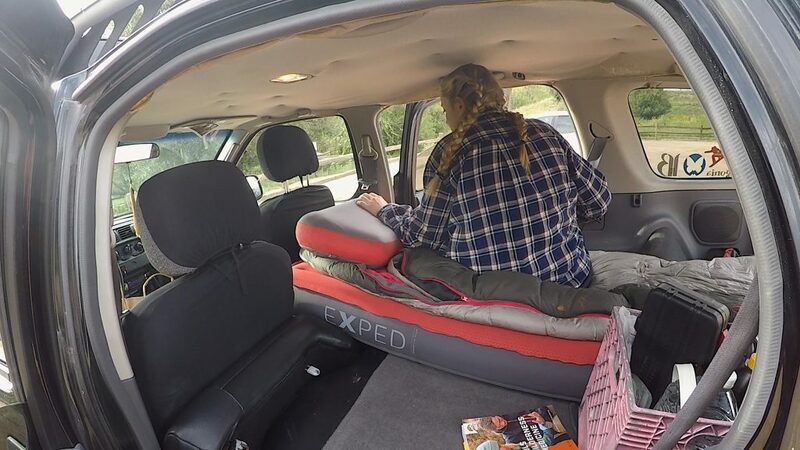 But if your life can handle the Megamat’s size, you’ll quickly find that it’s a luxurious game changer in the backcountry, camping, and in the back of your car. The price is high, but worth the investment in the long run in regards to comfortability. The “Lite” in Megamat’s name comes from the relative weight compared to other luxury sleeping pads on the market; it weighs about half of its competition and packs down small for its size. In a nutshell, the Megamat Lite 12 LXW is extremely comfortable; I cannot stress that enough. Not only is it luxurious, but also it is very versatile. Take it on short backpacking trips, throw it in the back of your car, take it to Christmas at the in-laws where you usually sleep on the couch, take it camping, take it traveling and use it on top of the worn down hostel bed- the possibilities are endless. The Megamat Lite 12 LXW is made of soft, yet durable material. 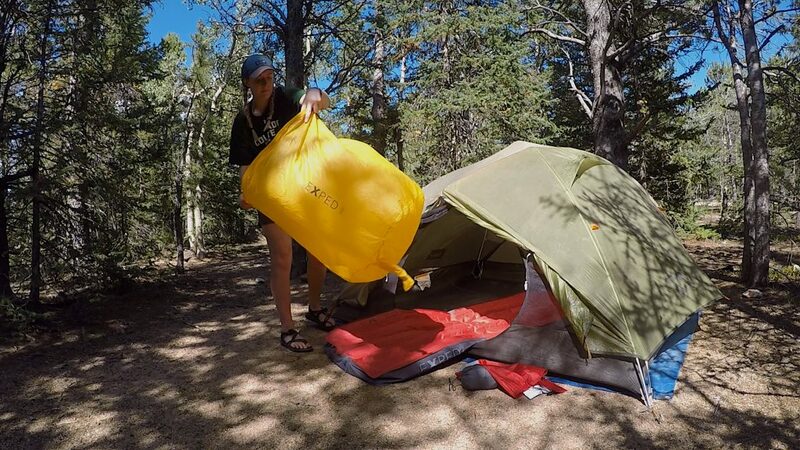 It is easy to set up and pack up, and the stuff sack is multifunctional as well. The only cons I would throw at this product is that it’s almost excessively large. I would still be just as comfortable with something not less thick but less wide and long. I had to turn the Megamat sideways at an angle to fit it in my tent, and it just barely fits in the back of my car with both seats down and the passenger seat pushed all the way forward. Keep in mind that I’m saying this and I’m only 5’10”, so a larger person or someone who likes extra room would certainly be satisfied with the size. With that being said, I would still give the Megamat Lite 12 LXW and Mega Pillow 5 out of 5 stars. I know I knocked it a little for the size, bulk, and weight, but this product wasn’t designed to be minimal. It was designed to be large and luxurious, while still being compact and functional—and Exped nailed it. 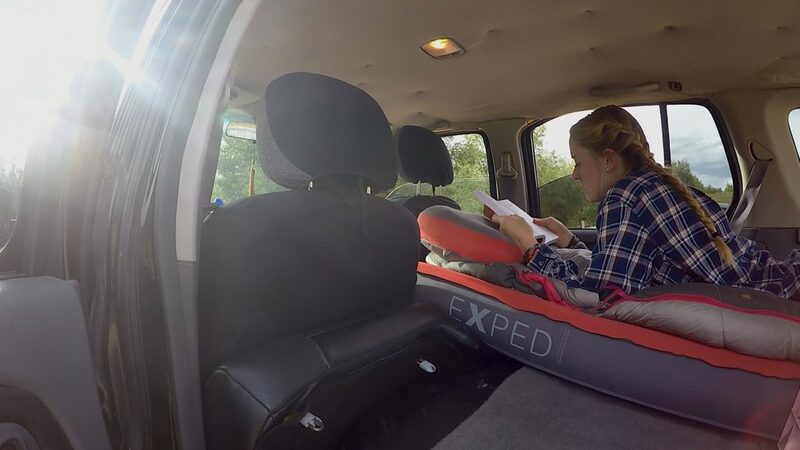 Overall, this product is perfect for the adventurer on the go who wants to enjoy the comfort of being in their bed at home wherever they are in the wild or the world. Shop the Exped Megamatlite 12 LXW and Mega Pillow on Outdoor Prolink. Not a member? Apply today! 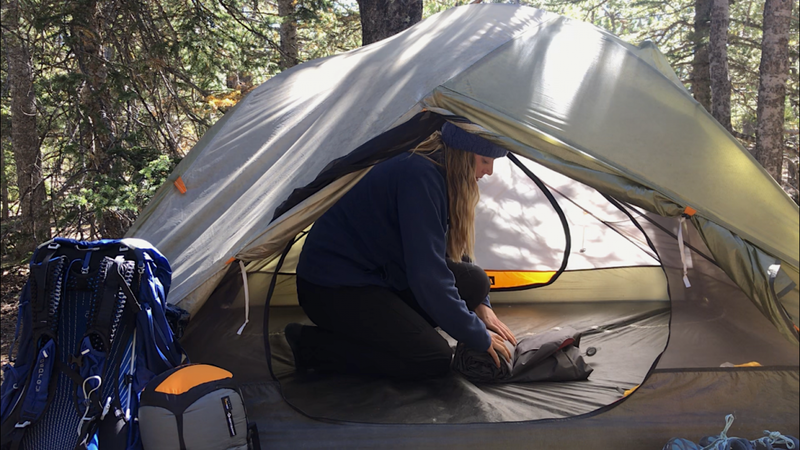 Bethany (“Bee”) put her Biology degree to good use right after graduating from Colorado State University by working for Pali Institute near Big Bear, CA as an Outdoor Educator for two seasons. Bee is also an experienced trip leader and has even led teens in Tanzania where they summited Kilimanjaro, and in the Tetons where they thru-hiked the Teton Crest Trail. 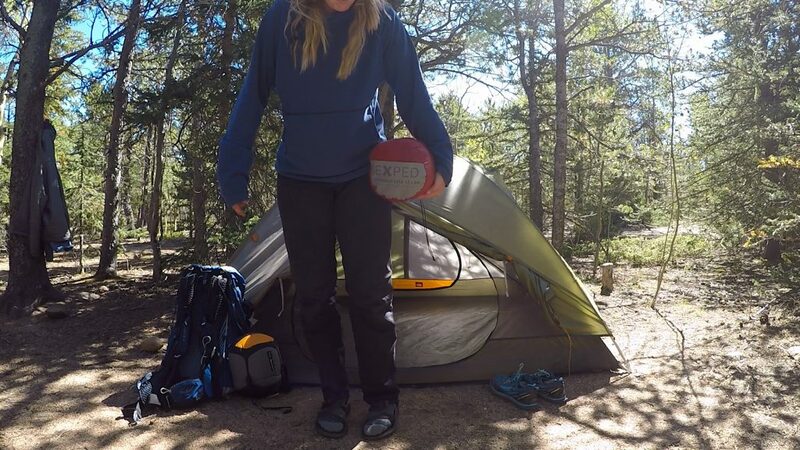 When not working with students outdoors, Bee is most likely snowboarding, rock climbing, trail running, mountain biking, and backpacking in the Colorado mountains that she calls home.